All categories »	Impulse Sealers (Vacuum Sealing) »	V-401-NTW Series - Tabletop Ejector-Type Vacuum Sealer for Watery Items! 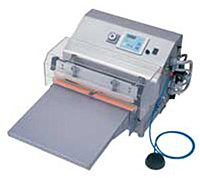 V-401-NTW Series - Tabletop Ejector-Type Vacuum Sealer for Watery Items! The V-401NTW series of vacuum sealers are designed for packaging liquid and powder items. It has a drip-proof, stainless body. The V-401NTW liquid packaging solutions utilize the ejector-vacuum method, which uses the flow of compressed air to directly eject the gas inside the bag to the outside of the machine. The V-401NTW commercial sealing machine is easy to use with its microcomputer sequence controller which controls the machine’s movement and temperature. Just depress the air pedal in order to start and complete the operation. The operation method (seal only, manual or timer vacuum) can be selected by using the selection switch. An optional clear cover is available to cover the entire sealing area to prevent the risk of fingers from touching the area. Anti-overheating feature automatically shuts off the power when continued to be distributed beyond the time set. Other voltages available on request.